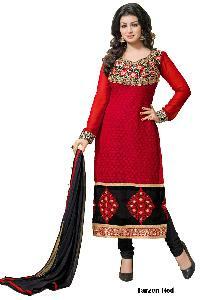 The Tarzen Designer Churidar Suits, provided by us, have the fine finish and appealing design. We own a capacious and well structured warehousing unit wherein we store the entire lot away from diverse damaging factors such as moisture, rain, sunlight and various others. Our entire array of products is sternly manufactured using certified array of raw materials. These inputs are sourced only from trustworthy vendors present in the market.